This a sponsored post for Klondike Brands but all opinions are my own. In our home big meals often involve us squeezing in and passing around the tortillas and salsa as we sit/stand around the kitchen island. These very informal meals are usually breakfast. We have a dining room with a big table a few feet away, but the kitchen is the place to be for breakfast. From pancakes and frittatas, to huevos rancheros and chilaquiles, our breakfast will always be something comforting, filling and delicious. 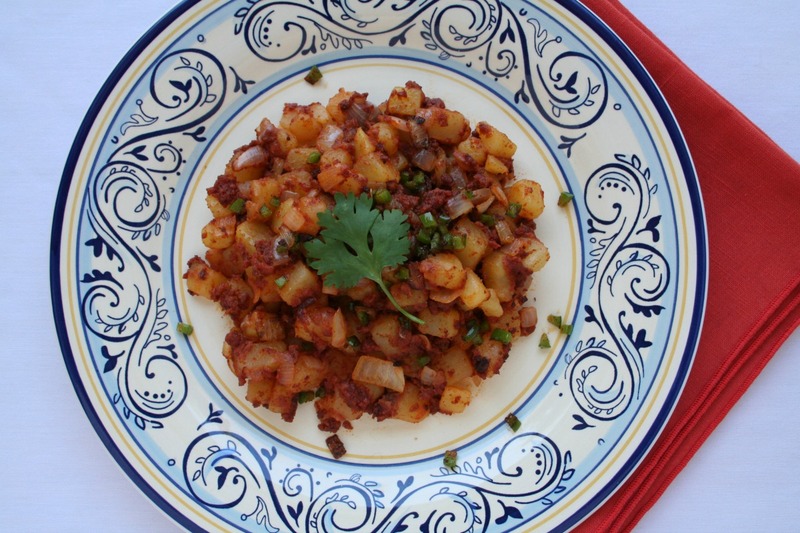 That being said, whether I’m cooking or my husband is, papas con chorizo is a house favorite. The scent of chorizo cooking is enough to get the whole household moving, just like the aroma of frying bacon and brewing coffee can perk anyone right up. So you can imagine the impact Klondike Pure Gold™ potatoes can have on my family when it comes to breakfast. Pure Gold™ potatoes are versatile, and are great for this recipe. The potatoes will soak up the flavors of the sautéed onions and spicy chorizo as they crisp slightly, and they are right at home in a warm corn tortilla or served with a fried/poached egg. The whole meal can be put together fairly quickly but will leave huge smiles on your family’s’ faces for a long time. 1. Place the potatoes in a large pot and cover with cold water. Bring to a boil over high heat. Allow to boil until they become tender, but not entirely cook through. Allow the potatoes to drain and lightly pat dry. 2. Heat a large, heavy skillet over medium-high heat. Add the chorizo, breaking up the sausage chunks with a wooden spoon. Cook until done, about 7-10 minutes. 3. Use a slotted spoon to remove the chorizo to paper towel-lined plate. Allow the excess fat to drain. 4. In the same skillet, drain off all but 1 tablespoon of chorizo fat, sauté the onion and jalapeno over medium heat until soft and fragrant, about 3 minutes. 5. Add the par-cooked potatoes. Season with salt and pepper. Cook for 10-12 minutes, allowing them to brown and even get crispy. 6. Stir the chorizo into the onion and potatoes. Serve with corn tortillas or Mexican bolillos.